Spa Delights: A SPA DELIGHTS GIVEAWAY! To Introduce our store and generate a bit of excitement, we are having a GIVEAWAY! Hurray! 1. Leave a comment about what color face-cloth you would like to see in the store in the future. Be sure to leave your contact info if it's not contained in your blogger info. This will get you one entry. 2. FOLLOW OUR BLOG! This will get you an additional entry and prize of TWO MORE BARS OF SOAP if you are chosen. Make sure you post a comment that you are following the blog so you get your additional entry! We will randomly enter all comments (including those that say they "follow" the blog) into the random number generator on May 30, 2009 and notify the winner. Good Luck! i'm partial to neapolitan colors - pink, brown, white. maybe a neapolitan face cloth? combine all three colors? or make a set of 3 - one pink, one brown, one white. imma get some ice cream now. Great giveaway and nice blog you have here. Sage is a favorite color of mine, second only to pink. Thanks for the chance at this lovely giveaway! I tend to be a fan of kelly green, so that'll be my pick for facecloth color. :) Great giveaway! I've always been a lover of purple and green or pink and green. Following you now...That just sounds creepy. Come on over and check out my giveaway. Win your choice of glass tile pendant. 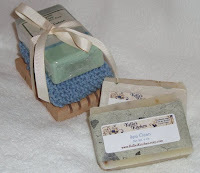 I would love beige or green:) Something natural..
Can't wait to see your soap shoppe! I would love to see some green tones and also hunter (leaf and camo). Going to be following you too so i know when you update. I want to see green! Everyone overlooks green, but it wears well and looks good with a lather! And I'm following now! 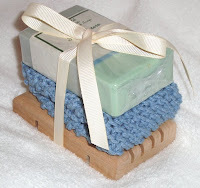 It's always good to follow soapy blogs! I would like jewel-toneds cloths, a deep blue, shimmery purple, emerald green..
what a BEAUTIFUL set!!! well, i love all things pink but I think you already have pink as shown in your post below...i think i'd love a red or emerald green. I like forest green, and dark reds. I think they'd be very pretty choices - but maybe not the best for cloths? I don't know. I like ocean blues and sage greens...the giveaway is fantastic!! We're following you, will you follow us? I confess, I don't blog nearly enough! Lol... anyway, can't wait for your shop to open! I love the color yellow!! That would be a great face-cloth color!! Have you thought of putting your etsy mini on the side bar? It's a quick way for people to get to your shop from your blog. 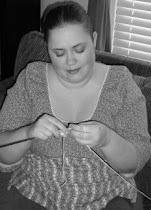 Following your blog!! Look forward to seeing more soap! I'd like to see a green face cloth. I'm a follower. Looking forward to seeing all of your new products! so my bathroom is light green dark red and pale yellow! I love these colors! I love all earth colors....greens, reds (red rocks of Sedona red), creams. Thanks for the chance and best of luck! I would love to see an apricot orange color face cloth- bright & refreshing! Thanks for the giveaway! I'd love to see some striped washcloths - pastel and dark colors always look nice together, in my opinion. Congrats on the shop opening! I would love to see a yellow and pink striped cloth! oh, and i just started following your blog! Hi y'all! I'm so excited to see that you are opening a soap shop! It looks so great so far. I would love to see a minty green or royal purple face cloth in your store. Good luck with the new shop!! I would love to see a beautiful light teal, sea foam green, Tiffany blue type color! I love sage green or soft yellow/ blue combinations. I'm following too! I would love a combination of 2 colors. Pink, brown, pink, brown. It's so gorgeous and elegant. and im following your blog! well im trying to follow it but my computer keeps crashing. yep im a successful follower now! i'd like to see a two toned cloth in red and pink! I would love pink or yellow. I would love to see PURPLE washcloths, as that is my favourite colour. Or how about purple & white stripes? I'm having my blog give away also.Feel free to join. Ohh! Let's see. I'm really going on a pink color kick right now. That would probably be my pick for the face cloth color. 1. Red? I don't see many cloths that color and it is such a great color! 2. I watch your blog now!